Our Birdorable Bonanza: 2015 Advent Edition continues today with a parrot that lives Down Under: the Superb Parrot! The Superb Parrot is a medium-sized species of parrot endemic to Australia, where it is found in the southeastern states of New South Wales and Victoria. They consume a diet primarily made up of plant material, including seeds, fruits, flowers, pollen, and nectar. Superb Parrots have a mostly green body plumage. Male birds have yellow across the forehead, face, and neck, which is outlined by red at the top of the breast. They have pretty orange or yellow-orange eyes. Superb Parrots are found in aviculture, or the pet bird trade, where they are known to live up to 30 years. They are known by other names in aviculture, including Barraband's Parrot, Barraband's Parakeet, and Green Leek Parrot. 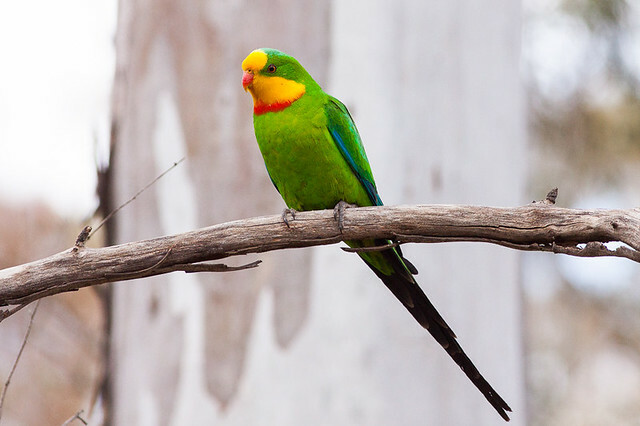 The Superb Parrot is our 631st Birdorable bird. Our Bonanza continues tomorrow with a songbird found on both sides of the Pacific Ocean that goes by two common names. Can you guess tomorrow's species? We've recently added the Pink Cockatoo to Birdorable as our 616th species and our 94th parrot species. This pretty bird is also commonly known as the Major Mitchell's Cockatoo. Parrots are known for their longevity, and one particular famous Major Mitchell's Cockatoo recently celebrated his 82nd hatchday. Cookie is a handsome male bird who has lived at Chicago's Brookfield Zoo since the zoo opened in 1934. Cookie was hatched on June 30, 1933, in his native Australia. The Guinness Book of Records recognizes Cookie as the oldest living parrot; the average lifespan for Major Mitchell's Cockatoos in captivity is 40-60 years. Cookie has smashed this record by a significant margin. Here is video of Cookie's latest birthday celebration, which took place at Brookfield Zoo. At first glance you may think that there are two different species of parrot in the above picture, but these are actually two Eclectus Parrots, with a male on the left and female on the right. The technical term for this is "sexual dimorphism", which in birds is often manifested in size or plumage differences. In birds of prey the female is usually bigger, and in ducks the male often has a much more colorful and complicated plumage than the female. With most birds in the parrot family the sexes are similar, but not in the case of the Eclectus Parrot. Males have a bright emerald green plumage and females are mostly bright red with some purple/blue plumage. Even the bill color is different. The Eclectus Parrot is the most sexually dimorphic of all parrot species. The difference is so pronounced that the first European ornithologists to see Eclectus Parrots in the wild on their visits to South-East Asia and Australia mistakenly thought that they were two distinct species. In fact, males were first described in 1776 and females not until 61 years later. It wasn't until the early 20th century that they were finally considered one species.